Want to learn more about our local salmon? Become a Salmon Docent! Salmon hold ecological, commercial, and cultural significance in the Pacific Northwest. Through this 2-day training, join regional experts to explore how our salmon survive their epic migrations and the challenges that they face in today’s changing world. Attendees will engage with material through field trips and hands-on activities. 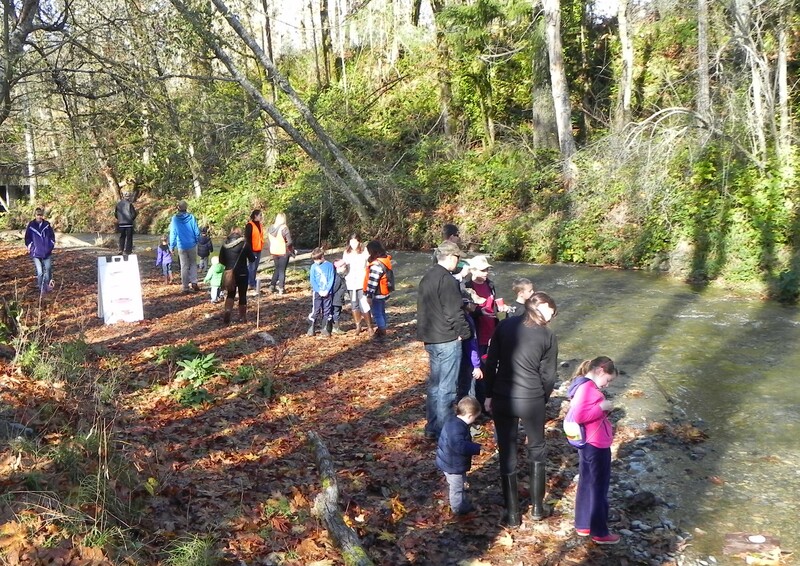 Local organizations will share current research findings and provide tangible volunteer opportunities on salmon-focused projects across Kitsap county. Our training culminates with the opportunity to become a docent at our annual Kitsap Salmon Tours event, giving trainees the chance to share what they’ve learned with the public. Attendees who sign up to participate in a 2-hour shift as a streamside docent will receive a FREE 70-page waterproof Kitsap Salmon Field Guide, available only to Kitsap Salmon Docents. Get to know Pacific salmon! Feel free to download, share, print, and laminate these these high quality educational resources, which have been designed to work together or stand alone. Please do not edit or alter the publications, graphics, or wording of these copyrighted materials.